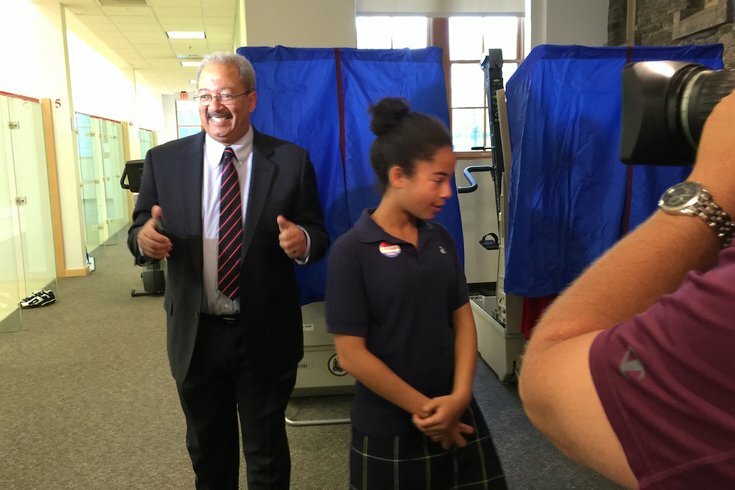 Incumbent U.S. Rep. Chaka Fattah votes in the April 26 Pennsylvania primary. He faces three primary competitors in his effort to secure a 12th term in office despite a looming federal corruption trial. Editor's note: This story was updated at 6:25 p.m. In his re-election quest, U.S. Rep. Chaka Fattah’s campaign released a minute-long, get-out-the-vote robocall on Tuesday featuring both City Councilwoman Cindy Bass and state Sen. Vincent Hughes urging support for the incumbent. But the local supporters aren't what makes this robocall stand out. It's the quotes from President Barack Obama and former President Bill Clinton. Granted, the presidential quotes weren’t offered with a primary day robocall in mind, but that’s what some voters in the 2nd Congressional District will hear today regardless. In the hours since this story went live, a deputy press secretary told Politico that the White House "did not approve" of his voice being used in the call. We'll ask Fattah for comment at his post-election gathering in Center City this evening.
.@JFriedman44 on Fattah: "We have not endorsed a candidate in this race and did not approve of the president's voice being used in this ad." The White House says it didn't sign off on an Election Day robocall featuring an old clip of Obama praising embattled Rep. Chaka Fattah.